This historic book may have numerous typos and missing text. Purchasers can usually download a free scanned copy of the original book (without typos) from the publisher. Not indexed. Not illustrated. 1859 edition. Excerpt: … Chapter Th Op The String, The Bracer, And Shooting Glove. THE STRING. Of the bowstring very little need be said. The only good ones are of foreign make, and the very best are, I have understood, the produce of one particular maker, a Belgian, in whose family the secret of their manufacture is preserved with such jealousy as to cause a fear of its being lost, inasmuch as its present possessor is the last of his race. 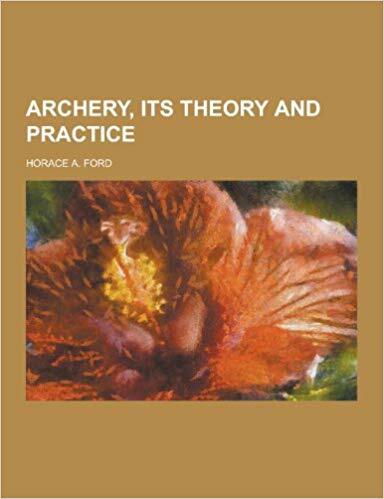 A thick string is generally supposed to cast the steadiest, a thin one the sharpest; but, though preferring the latter myself, I have not been able to discover much practical difference between them; the strength of the bow must, however, somewhat regulate its substance. In any case the string should be round and even, with a tolerably thick eye at one end for the upper horn, and plenty of substance in the twist at the other to form the loop for the lower end of the bow. This loop is formed by giving the appropriate end of the string one turn round itself, and interlacing or twisting it three or four times afterwards; taking care to do this evenly and firmly, so as to prevent slipping, and waxing the end before doing so. The length of the string between the loop and the eye must of course be regulated by the Tile Loop. length of the bow; and ought to be such that, when the latter is strung, a space of at least six inches for a man’s, sxi&five inches for a lady’s bow, should exist between the string and the centre of the bow. The string for one inch above and five inches below the nocking point must be lapped with thread or thin twine, well waxed, of such a substance as nearly to fill the nock of the arrow, and this again, as far as is covered by the fingers when drawing, with a lapping of floss silk.